A May Day commemorative ceremony under the auspices of the United Left will be held at 8.00.p.m. in New Street, near the former home of the 1913 Union Leader John Lynch. Following the ceremony at 8.30.p.m. Dr John Cunningham (author and historian NUI Galway), and Mr Brian Scanlon (I.T.G.W.U. 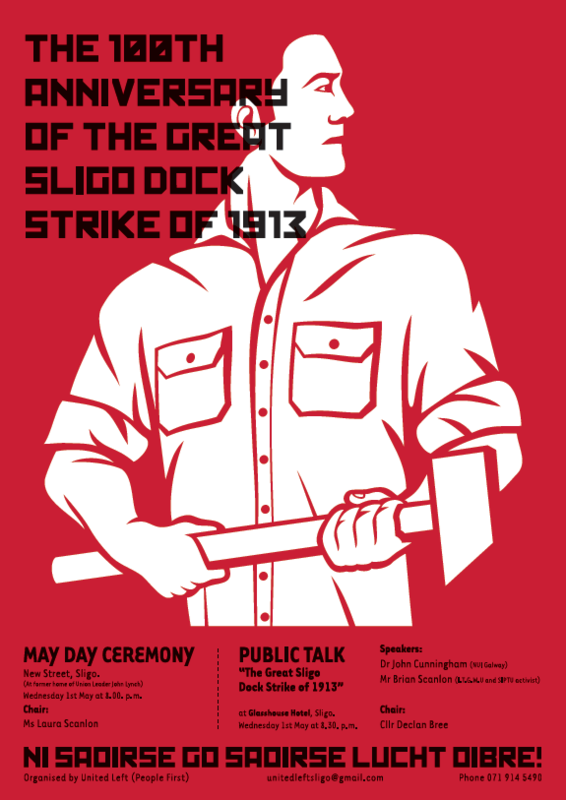 and SIPTU activist) will talk on “The Great Sligo Dock Strike of 1913”, in the Glasshouse Hotel. Members of the public are encouraged to attend both events. Speaking today Cllr Declan Bree said “While 1913 is regarded as the foundation stone of the modern Dublin labour movement it must be pointed out that it is also the foundation stone of the modern socialist and trade union movement in Sligo and the North West. “The Dublin lock-out of 1913 is well documented and has found its way into mainstream history. However those of us on the left are also very much aware of the significance the year 1913 hold in terms of the development of the labour and trade union movement in Sligo. “The 1913 dock strike in Sligo will always have a special place in the history of our movement. And while the Dublin battle attracted much attention because of its duration, location and scale, the strike in Sligo, lasting eight weeks, during the months of March, April and May of 1913, was, in reality, of equal significance and importance. “Intervention by employers and the introduction of ‘scab labour’ led to clashes on the docks and riots in the town and one striker, Patrick Dunbar, was killed. “On the 6th May 1913 settlement was reached when the employers caved in and the position of the IT&GWU at the port was secured.” said Cllr Bree. Was Russian script the way English was written in Sligo in 1913? Yes. Of course it was. I’m surprised you didn’t know that. Eh, what Russian script? Don’t see any cyrillic letters there. Can you point them out? Soviet type design, I’m presuming not what posters looked like in Sligo in 1913. Though there is a great book about there being only one red army that has a cover like that…. Incidentally, I remember reading something somewhere about a British graphic designer designing a typeface for use by the common man. The typeface is quite well known now. Shame I cannot remember which one it is. There is something to what Bob says – posters like that do seem to use a certain typeface that make me think of Socialist Realism and the Russian Revolution. Whether it is a ‘Russian’ typeface, I do not know. What is “United Left (People First)”, is it simply part of the “United Left” a la Clare Daly / Joan Collins, or yet another formation? Is it? Why the () qualification though, it reads like a subset of the UL. Meant to say though, like the poster design, very nice. Yeah, could be a subset. The Sligo group is of long standing and probably prefers to signal its more familiar identity though it is now part of the United Left a la Clare Daly / Joan Collins/ Declan Bree. I’d imagine that Declan Bree (who is organising the Sligo May Day events) will be delighted at the news that Ken Loach is making a film on Jim Gralton. Declan, a tireless promoter of the labour history of the north-west, ran a series of Gralton history weekends in the 1980s and 1990s, thereby helping to ensure that the Leitrim communist deportee was not forgotten. Siptu has an event in Sligo tonight marking the centenary of the 8-week-long Sligo general strike of 1913 (Town Hall, 8 pm), and remembering Patrick Dunbar, an ITGWU member killed by strike-breakers in the course of that dispute (Sligo cemetery, 6 pm).